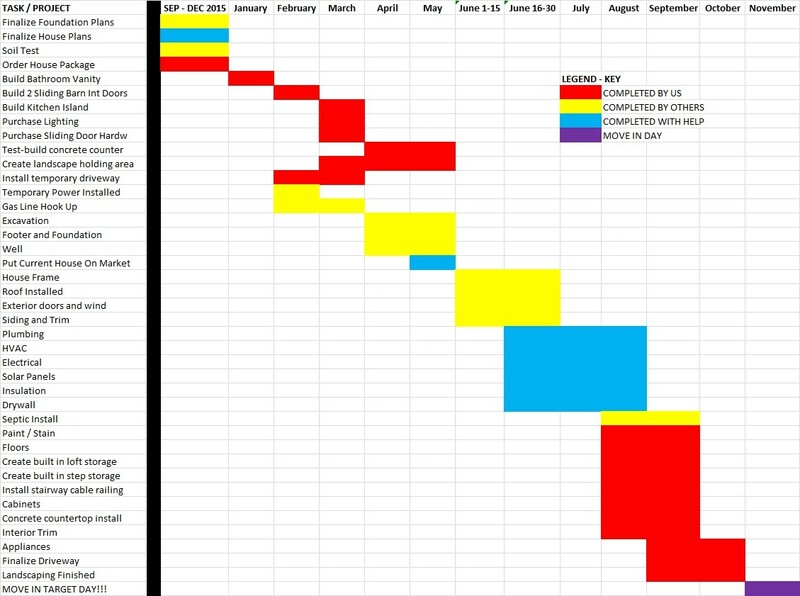 One of the best ways to complete any large project is to create a building timeline showing what needs to be done – and by when. In fact, it’s really the only way to keep everything on schedule, moving forward, and perhaps most importantly – on budget! Since we are responsible for coordinating the entire process of the “Simple House Project” – having an accurate timeline is critical. It will help us keep the flow of the process on track – letting us know when we need to have everything from the foundation poured to the kitchen cabinets installed. Our timeline is unique in that in addition to coordinating the various hired trades for the project – we will also be responsible for completing most of the interior. In addition to drywall, installing floors, hanging cabinets and painting – that also includes building many of the items that will go into the house – like the kitchen island, table, bathroom vanity and sliding barn doors. As part of that timeline – we also have to consider when to sell our house. It’s funny – every time we write an article for this series – it makes us realize just how much there is to do. All the more reason for a timeline! During the past three months of 2015, we finalized much of the paperwork side of the house – including foundation and building plans and the soil tests for the septic and well systems. While the actual building process won’t begin until the dirt begins to move in late April or May – there are many tasks that we can get started on during the pre-build months of January through April. Projects such as building the interior barn doors and kitchen island. Not only will building them save big money on the budget – it insures they will be ready to go when needed during the build. Of course, in addition to all of that – we just want to create a lot of what goes in to our home! Last but not least – we realize there are going to be variables in the process that can change the timeline. No matter how much we plan – things like the weather, material delays, or of course “human error” can all change the timing and outcome of the project. And then there are the “what if’s” of the process. For us right now, the biggest “what if” is our current house. As in what if it sells too soon or not soon enough? In an ideal world we would put the house up for sale in August, sell it by the end of September, and move out and into the new house November 1st. However, early Spring is simply the best time to put homes on the market. We’ve decided to put the house up for sale in May, realizing that yes, it could sell fast and leave us scrambling a bit – but we would rather have that option than the thought of being saddled with two places for very long. At the end of the day, if the house sells quickly, we can deal with it. As a positive, since the house we are moving to will be small – it’s not like we will have a ton of items to put into storage! After all – it is called the “Simple House” for a reason! 🙂 As always, you just have to go with the flow and have fun with the process. ← Simplicity for 2016 – Happy New Year From OWG!